Thanks to lightning bugs, we can enjoy a second starry night sky in summer- - regardless of clouds or rain! On the East Coast, North Coast (the Great Lakes) and place s in between, lightning bugs are brightening evenings. In a recent e-mail conversation, Cole Gilbert, a Cornell University professor of entomology, shared two important facts: “Lightning bugs, or fireflies, are neither bugs nor flies. They are adult lampyrid beetles. ”Fireflies that flash in the evening," Gilbert continued, "are not found west of the 100th meridian.” The 100th meridian is at the western boundary of Oklahoma, just before the panhandle shoots many miles more to the west. Lightning bugs start arriving, a few at a time, in mid-June. As the weeks progress, they become more numerous and it seems, more vivid in lighting the night. According to researchers Sara M. Lewis and Christopher K. Cratsley, lightning bugs flash at night to attract mates. Male lightning bugs fly through the night flashing certain patterns, perhaps the lightning bug equivalent of “Hey, come here often?” Female lightning bugs tend to stay on the ground and watch. When they see a pattern they like, they flash in reply and the male flies to them. There are chemical reasons that lightning bugs can make light. However, I do not think I can explain the chemistry in a concise manner to fit the blog. If something glows at night, one might think this is suicidal behavior, that the light will draw predators. Lewis and Cratsley summarize research that shows lightning bugs have certain chemicals that make them unpalatable to predators. However, the researchers also cite other research that there are predatory lightning bugs. One of them in the eastern United States can mimic the mating lights of a female, luring a male in and then making him dinner. Lightning bugs are declining in parts of their range. The two main reasons for the decline are light pollution and habitat destruction. 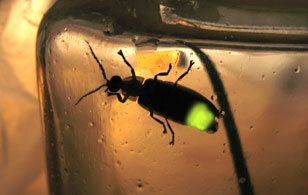 Firefly.org suggests that landowners can help by leaving rotting logs and leaf litter on some parts of their property for lightning bug habitat. Other suggestions include leaving some parts of a lawn unmowed or reducing pesticide use. Another good source for lightning bug information, which one of my friends pointed out after this post went up, is the Boston Museum of Science's website. See the web address below. Linda Brown and the Harvard Dialect Survey, suggest that the name a person uses for this insect suggest where they are from. Brown suggests that Southerners tend to call these insects “lightning bugs.” The Dialect Survey found that the term “lightning bug” tended to be used in the South, lower Midwest and parts of New York. The term “firefly” tended to be used in the upper Midwest, western New York and New England. Lightning bugs appear in literature. My favorite is from Mark Twain, who once wrote, in a letter to George Bainton in 1888, “The difference between the almost right word and the right word is really a large matter--it's the difference between the lightning bug and the lightning.” My friend Seth discovered that Marilyn Kallet has a nice poem, about the many emotions triggered by seeing fireflies, on her website. In the witty spirit of Mark Twain, one reader wrote that this post inspired "looking at fireflies in a whole new light." It was fun to research this post. But now, it’s time to turn off the lights and go watch lightning bugs.